Descendants of John McCrae with the newly unveiled provincial plaque. From left: Donald Campbell, great-nephew to John McCrae; Geills McCrae Kilgour Turner, great-niece to John McCrae; and Mrs. Phoebe Campbell. Each Remembrance Day Canadians take a moment to remember those who have given their hearts and lives for Canada. In those moments Canadians will most likely hear the famous three-stanza poem that reminds us of what was sacrificed, but that also motivates us to carry on their efforts. John McCrae was a great surgeon, poet, and soldier. During the last two years of his life he became an international celebrity. 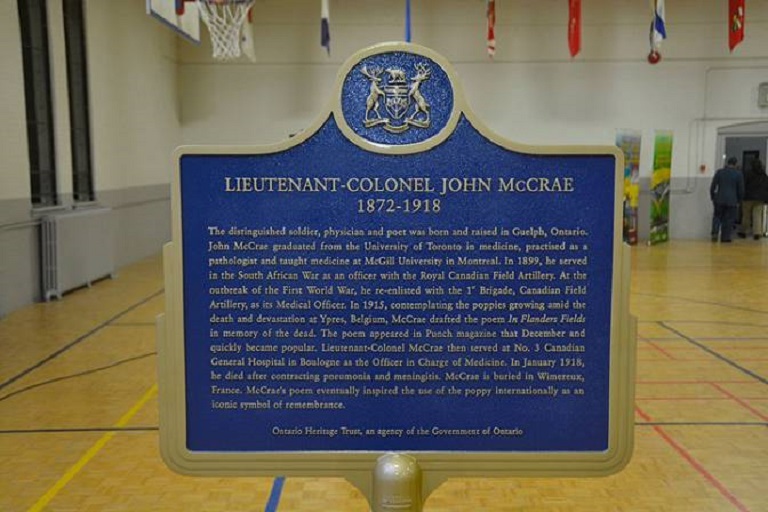 McCrae was raised in Guelph, Ontario, which is where the provincial plaque honouring McCrae’s achievements and sacrifice has been recently installed. 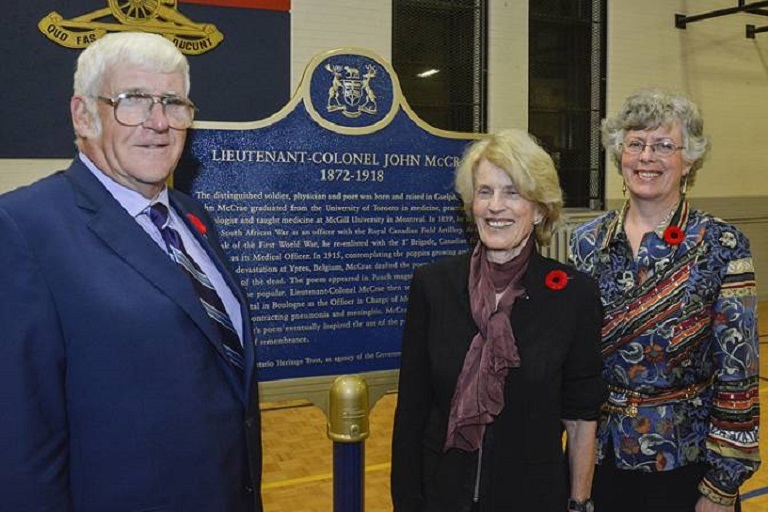 On November 6th the plaque was formally unveiled at the Guelph Armoury. The event was co-hosted by the Royal Canadian Artillery (11th Field Regiment), McCrae’s old military unit, and Ontario Heritage Trust. “He wrote his first poem and was a distinguished cadet in Guelph… His father, David, was important in founding, developing and leading the local regiment right up to the First World War,” says Fraser. After growing up in Guelph, John McCrae attended medical school in Toronto and then travelled to Montreal and the United States to further his medical career. The plaque was officially installed on the morning of Tuesday, November 11, 2014 at the Lt-Col John McCrae Memorial Garden and Cenotaph near the corner of Water Street and McCrae Boulevard. The students and the John McCrae Public School and local School Board hosted the plaque installation.